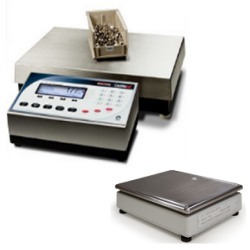 Rice Lake Dual Platform Counting Scale 2 lb / 50 lbRice Lake Counterpart Dual Platform Counting Scale. Small sampling scale 9.6" x 6.9" with 2 pound capacity for super accurate sampling and large 13.4" x 11" 50 pound capacity for counting heavier amounts. A counting scale like this can count almost any size parts accurately. Rice Lake Dual Platform Counting Scale 2 lb / 25 lbRice Lake Counterpart Dual Platform Counting Scale. Small sampling scale 9.6" x 6.9" with 2 pound capacity for super accurate sampling and large 13.4" x 11" 25 pound capacity for counting heavier amounts. A counting scale like this can count almost any size parts accurately.